Not mentioned in yesterday's post about the session at Sebonac Inlet was Jeff's breakdown. We all saw Jeff spending some time in the water working on his rig. He was in the shallows and only a few hundred yards out, so while everyone had an eye on him nobody was particularly concerned. After about five minutes he walked his gear in to the beach on the far side of the inlet. Once on the beach it was clear from where we stood that he'd broken a boom arm, but not until he got close to the inlet could we see that both arms were snapped. 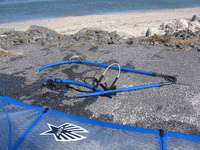 Many windsurfers are familiar with the recommended strategy of dealing with a broken boom, the usual case for which is a single snapped arm. If you were sailing outbound when the break occurs, just turn the board around, uphaul (or waterstart most gingerly), and gently sail back to shore using the one good arm. Remember that your boom is at half strength at best...whatever weakened the other side to the point of breaking probably has lessened the strength of the good side as well. And if the inbound side of the boom is snapped, then it's a matter of releasing the outhaul, removing the boom over the tip of the mast (don't seperate rig and board), flipping the boom, reattaching and retieing the outhaul. Your harness line will be upside down but bfd...you're still sailing home. * This is less of a hassle than it sounds like...I once contemplated swimming my gear the few hundred yards to shore when this happened to me, but flipping the boom only took about two minutes. Also, doing it once is a great confidence booster. Jeff positions himself on the upstream side of the inlet, tosses his broken rig in, and swims like a sunuvabich and makes the other shore! Then he swims BACK, gets his board, and does the same, by which time I'm happy to say I'm back on land and able to help him the last few feet. Later we learn that he used to be a lifeguard. It showed! The Peconic Puffin regrets that we can not bring as many details to you as Jeff. As soon as Jeff tells his story on his own blog, we'll link to it directly for additional color and detail. (UPDATE: HERE IS JEFF'S POST.) Meanwhile in the interest of safety it's good to think about what to do in the event of a complete boom failure...in a discussion about hypothermia here a week or so ago, complete boom failure was not considered in the mix of things that could go wrong. * Unless you're Bjorn Dunkerbeck, who once reportedly sailed out to someone who broke a boom in crazy conditions at Hookipa...the break was on the wrong side for heading back in, so he just came in clew first overpowered. *** The preferred launch is on the other side of the road. ****If anyone has different ideas about what to do in this situation (or has any other thoughts on the matter), please comment! UPDATE: See Jeff's photos from the day as well as his other fine windsurfing and water-related photography. It was a pretty wild day! I've uploaded some photos here: http://www.flickr.com/photos/peconicwindsurfer/ and hope to update the blog in the next day or two. Thanks Michael! "not until he got close to the inlet could we see that both arms were snapped." I was, like, "OH MY GOD I am NEVER going windsurfing...that's HORRIBLE!" Then I realized that you were talking about GEAR. Phew. A BOOM arm, Bonnie! :) Someone has probably broken an arm windsurfing, but I've never heard of it. Not a lot of serious injuries in this sport. Jeff is fine...better than fine...it was something to watch someone swim against current and win! Ned Crossley from up at Cornwall on Hudson. Great Peconic Puffin Blog on windsurfing. Awesome tips, information, and sharing. Thanks. The windsurfing world is tiny and spread out and this sure helps to glue it together. I belong to 4 Yahoo groups: Hudson River Windsurfers and Hudson Valley Windsurfers ($10) as well as CT and LI yahoo groups. Thanks for joining the Hudson River Windsurfer Yahoo group. I live right up Cornwall on the Hudson across from the Bannerman's Island IWS meter. I'm the guy who got 3 telemetry sensors installed on USCG fixed navigation aides on Hudson last summer. Love to have you come up for windsurfing on Hudson at Cornwall....Tunnels, Bannerman's, and Kowawese. I like to speak to you on the phone. My numbers are 845 458 5204 home and 914 299 7552 cell. Thanks again for joining HRWer's and sharing the Puffin.